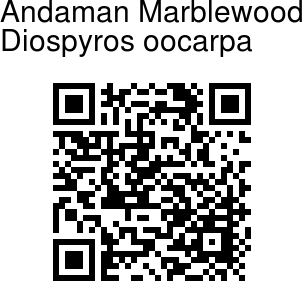 Andaman Marblewood is a tree up to 25 m tall. Bark is usually blackish brown in color and flakes are blaze brown. Branchlets are rounded, yellow-hairy when young. Leaves are simple, alternate, and distichous. Leaf-stalk is to 0.6-1.1 cm long, planoconvex in cross section, hairless. Blade is 5-12 x 3-7.5 cm,is narrow ovate to ovate, tip is pointed to long-pointed with blunt tip, where base is narrow, margin entire, leathery, hairless, drying brown. Midrib of the leaf is flat above. Secondary nerves may be 5-8, but not prominent, lower most pairs close, tertiary nerves are obscure. Flowers are unisexual, and dioecious. 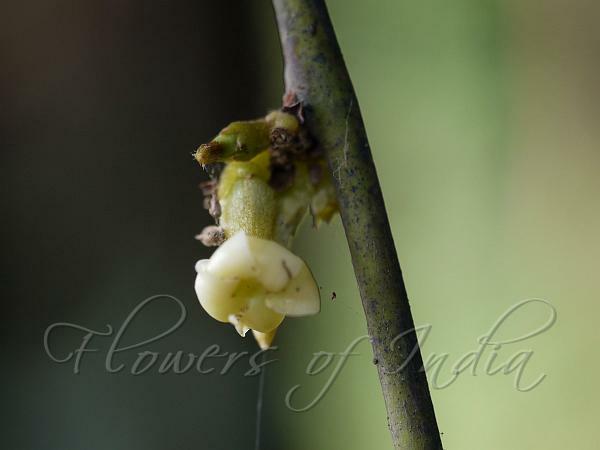 Inflorescence present,where male flowers in axillary sessile clusters, and are cream in color; where as female flowers 1-3, are axillary. Fruits are as berries. They are oblong-ovoid, 2.3 x 3.5 cm large, rugose; calyx is persistent. A fruit bear 1-seed per cell.